Snug, soft, weatherproof and extremely sturdy, the Havanna Hammock Chair is a popular choice among customers. Limited stock left. Once these sell out there will be no re-stock. The Havanna Hammock Chair is a king size hanging chair that boasts multiple uses. It is created with EllTex material, so it is built tough, weatherproof, yet as soft as cotton. Perfect for hanging outside on the veranda, under the patio, in the garden, on a hanging chair frame, and it is also great for breast-feeding mothers. 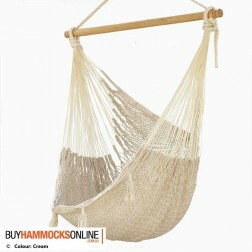 Purchase one of these great hammocks for you and your family and get free Metro Delivery across Australia.